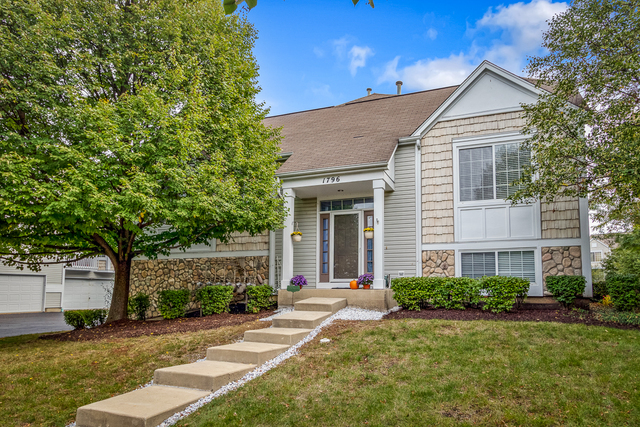 If you are ready for an easy move then this townhome is calling your name! This unique split level style allows for entertaining w/ an open concept floor plan that boasts vaulted ceilings, private balcony, new carpet, fresh neutral paint, & newly remodeled bathrooms w/floor to ceiling ceramic! The living & dining combo flows nicely into the separate kitchen that has a pass through window; perfect for cooking meals & mingling w/guests at the same time, or even asking for a quick hand with dinner! The master suite is host to it&apos;s very own private bath & walk in closet. The 2nd bedroom & 1/2 bath complete the 1st level. The lower level is where you will find the cozy family room w/fireplace that is tucked away for the ultimate peace & quiet, laundry room with new washer & dryer, and full bath! 2 car garage has an added bonus of large storage closet! Conveniently located near schools, playground, Metra train station, easy access to Rt 59, and walking distance to Harbor Springs Park! !